New Exclusive - Foldable flat pack design clam action trap incorporates a 20 mm gap along all meeting edges to minimise the risk of injuring birds. The woodpigeon is a wary bird that is reluctant to enter conventional cage traps. Birds enter this trap more readily because they don’t feel enclosed overhead and they walk in on the natural ground. The Elgeeco woodpigeon trap catches birds alive and unharmed. 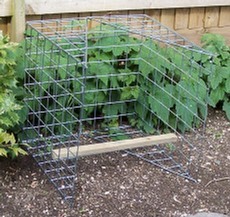 It is recommended that this trap is checked regularly and captured woodpigeons removed without delay.